Bruce S. Silverman, D.V.M. Diplomate American Board of Veterinary Practitioners. Dr. Silverman received his Doctor of Veterinary Medicine degree from the University of Bologna, Italy in 1975. Twenty two years were equally divided between Emergency and Critical Care and General Small Animal Practice. He became a Diplomate of the American Board of Veterinary Practitioners, certified in Canine and Feline Practice in 1985. He completed a two-year residency in Veterinary and Comparative Ophthalmology at the Boldy Animal Eye Institute. 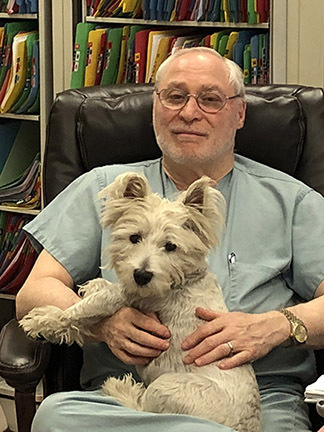 Dr. Silverman has been a guest speaker at several SCVMA chapter meetings and lectured nationally. His particular areas of interest include Oculoplastic Surgery, Glaucoma and Vitreoretinal Surgery. Copyright © 2018 Complete Animal Eyecare Center. All Rights Reserved.